It is the most important aromatic nitro compound. Both in the laboratory as well as in industry, nitrobenzene is prepared by heating benzene with a mixture of concentrated nitric acid and sulphuric acid at 50°C. The resulting nitrobenzene is separated, washed with sodium carbonate solution to remove any acid, and purified by distillation using an air condenser. The laboratory procedure and the one used on a large scale differ only in working details. layer is separated from the aqueous Iayer, washed with water and dilute sodium carbonate solution, dried over anhydrous calcium chloride, and finally distilled (at 207-211°C) using an air condenser. fractionating column and cooling the vapour in air-condenser. Nitrobenzene is a pale yellow liquid (bp 211°C ;sp. gr.1.087) having odour of bitter almonds. It is insoluble in water but dissolves readily in most organic solvents. It is steam- volatile. Nitrobenzene is highly toxic. 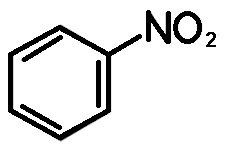 The chemical reactions of nitrobenzene are those of the nitro group and the phenyl group. These have already been discussed. The only important reaction of –NO2 group is that of reduction in acid medium, neutral medium or alkaline medium. as a high-boiling inert solvent in Friedel-Crafts reactions and in the depolymerisation of Crepe Rubber for making adhesives. in the preparation of benzidine and metanilic acid.